Aboard Sea Link en route to Dun Laoghaire. 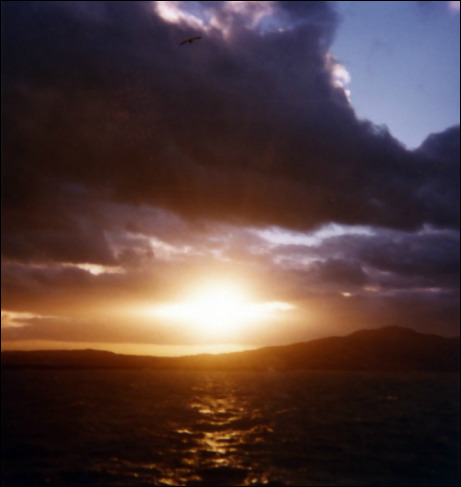 On my first trip to Ireland I arrived by boat. The crossing from Holyhead, Wales, to Dun Laoghaire, just south of Dublin, was violent and wet. There’s nothing hospitable about the Irish Sea in late December. I’d heard stories of ferry boats being forced to turn around and return to port when weather and waves conspired against their safe passage, and I hoped my journey wasn’t going to begin and end like that all in one night. Nobody else in the ship’s bar seemed to share my concerns as the huge Sealink boat pitched and rolled, so I joined the festivities and treated myself to a pint of stout. I was half a sea away, but the Guinness was already beginning to taste better than it had in England! Standing in the men’s room a few more Guinness later, I quickly realized why there were metal handicapped rails on the wall between every urinal: things could get seriously messy without something to hold on to while peeing aboard the S.S. O'Poseidon! And then, as if on cue to compliment the glorious sunset the boat was sailing towards, the winds died down, the waves relaxed (somewhat), and the clouds parted to reveal a pinwheel of streaming sunlight — the kind that precedes the appearance of heavenly hosts in Hollywood Biblical epics. If a chorus of angelic voices had accompanied the suddenly becalmed and dramatic weather I wouldn’t have been surprised. I headed up to the top deck where I clung to the cold rail and savored Ireland’s cold, wet kiss on my face; blown across the waves in a welcome I’ll never forget. Deep inside my gut —and it wasn’t the three pints of Guinness talkin’ — I felt a rush of primal emotion and I had this strange sensation that I was experiencing a sort of homecoming. At some point in my family’s history, someone had sailed away from this island, and now I was sailing towards it. What the hell? Were those tears on my cheek or sea spray? I couldn’t tell you then and I can’t tell you now. What I can tell you is this… the third time I travelled to Ireland I arrived by plane and I wasn’t flying solo. This time I was in the company of my lovely new wife. I remember looking out the window as the plane approached Shannon Airport and marveling at the green of Ireland’s shamrock shores. (They don’t call it the Emerald Isle for nothing.) And then… déja vu on steroids, that same sensation in my bones, in my blood, in my heart, in my soul, welcoming me home once again. In my lifetime I’ve had the incredible opportunity to travel all over the world, but few places speak to me the way Ireland does. The poetry. The history. The tragedy. The literature. The contradictions. The hospitality. The violence. The beauty. The music. Today’s Happy Medium Song of the Day comes from one of Ireland’s best kept musical secrets; huge at home, but never as popular outside Erin’s shores. From 1970 to 1980, Horslips defined Irish Celtic rock with their incredible fusion of traditional Irish reels and jigs and high energy rock n’ roll. Some days there is no better combination. St. Patrick’s Day is one of those days, and “King of the Fairies” is one of those songs. Happy St. Patrick’s Day.